In tenth-century Constantinople there was a man named Bardas. He belonged to the personal retinue of Emperor Romanos II. 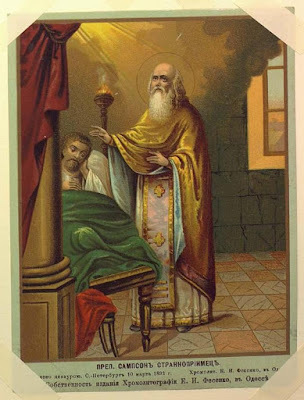 Moreover, he had obtained the office of xenodochos (innkeeper or chief administrator) of the Hospital of Saint Sampson. This indicates that the Hospital of Saint Sampson in the tenth-century, like the Orphanage of Constantinople, was not administered by the Patriarch of Constantinople or a monastic community, but by the imperial government. Bardas suffered from a severe case of anthrax that had infected his lungs. The physicians of the hospital examined him, and declared his case incurable. On the vigil of Saint Sampson's feast day (June 27), Bardas lay alone in the hospital since the physicians and the administrative staff (chartoularioi) had all left the institution to prepare for the following day's liturgy at the Church of Saint Mokios, where the tomb of Saint Sampson was located. That night Bardas saw an elderly man, who appeared like a monk, coming out of the hospital chapel into the main part of the building (known as the oikeia). The elder turned to Bardas and told him to get up. This happened three times, and on the third appearance the elderly figure added the command: "Go to the celebration at Sampson's tomb!" Bardas struggled to get out of bed. The older man then appeared a fourth time and disappeared. As Bardas rose from his bed, his pain disappeared. When he squeezed his chest, he felt air escaping from his lungs. Bardas summoned a female nursing attendant to help him remove his bandages. The woman removed the binding around Bardas' chest to reveal that he had been completely healed. The next day Bardas was strong enough to join the rest of the hospital staff at Sampson's tomb.